Thank you Ambassador Allen. I am so happy to be here and see so many old friends. Let me start by congratulating Ambassador Craig Allen for taking up this important post at the USCBC. 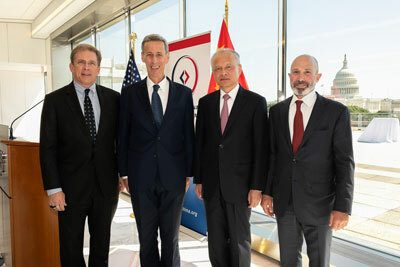 Your outstanding, long-term work in Asia in general and for China-US relations in particular will be a great asset, not only for the USCBC, but for all of us. I look forward to working very closely with you. I also want to thank Mr. Greenberg for very thought-provoking and inspiring remarks just now. Thank you for the work done by the board of the USCBC under your leadership. Let me also thank all the USCBC staff, your devotion and commitment over the years has made this institution a great success. Without you, we would not have been here to celebrate. Thank you so much. 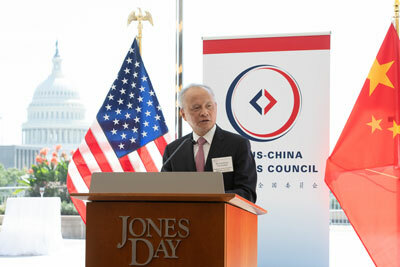 This year marks the 45th anniversary of the USCBC, and we are also celebrating the 40th anniversary of China's reform and opening-up. Very soon, next January, we'll commemorate the 40th anniversary of diplomatic relations between China and the United States. We have every reason to be proud of the achievements we have made over the decades. But now, again, we are at a critical historic crossroads. The choices we make today will have a long-term impact on our relationship and the well-being of our two peoples and even on the world. So that's why we say this bilateral relationship is the most important one in the world. Firstly, believe in the fundamentals. The world needs a steady and strong China-US relationship. Our two peoples need such a relationship. There can be no alternative, as an alternative would be rather terrible. Secondly, take a constructive approach. We have to aim at a win-win outcome. We have to aim at mutual benefit. There is no zero-sum game. Do not try to work for the so-called "upper-hand". And if we try to tell other countries that one of our two countries is a loser in globalization, they might think that we are somewhat hypocritical. We are both winners. We will continue to be winners. We will aim at a win-win outcome. Thirdly, give full play to entrepreneurship. I think most recently, we have heard too many complaints, which have generated a lot of negative energy. I don't think this should be the situation. I don't think this is the right situation. Our two peoples, Chinese and Americans, are very well-known in the world for optimism, for self-confidence, for pragmatism. We should give full play to our entrepreneurship. We should have a long-term vision and be forward-looking. We should be determined to face challenges and difficulties, be ready to solve problems and have confidence in ourselves. We at the embassy really look forward to working even more closely with all of you in the years ahead, so that we can build a strong, mutually beneficial and steady relationship together to the benefit of our two peoples. In conclusion, let me wish Ambassador Allen and the USCBC every success in your endeavors.